Italy’s national elections…featured populist promises of largess but neglected what economists have long said is the real Italian disease: The country has forgotten how to grow. …The Italian economy contracted deeply in Europe’s debt crisis earlier this decade. A belated recovery now under way yielded 1.5% growth in 2017—a full percentage point less than the eurozone as a whole and not enough to dispel Italians’ pervasive sense of national decline. Many European policy makers view Italy’s stasis as the likeliest cause of a future eurozone crisis." The scenario modeled assumes a permanent fiscal consolidation of about 2 percent of GDP (in the structural primary balance) over four years…, supported by a pro-growth mix of revenue and expenditure reforms… Two types of growth-friendly revenue and spending measures are considered along the envisaged fiscal consolidation path: shifting taxation from direct to indirect taxes, and lowering expenditure and shifting its composition from transfers to investment. On the revenue side, a lower labor tax wedge (1.5 percent of GDP) is offset by higher VAT collections (1 percent of GDP) and introducing a modern property tax (0.5 percent of GDP). On the expenditure side, spending on public consumption is lowered by 1.25 percent of GDP, while productive public investment spending is increased by 0.5 percent of GDP. The remaining portion of the fiscal consolidation, 1.25 percent of GDP, is implemented via reduced social transfers." So are Italians ready to take my good advice or even the so-so advice of the IMF? Nope. They just had an election, and the result is a government that wants more red ink. Five-Star wants expansive welfare payments for poor Italians, revenues to pay for it not included. 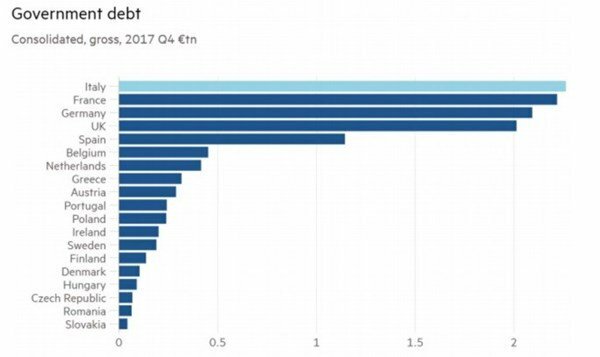 Italy’s public debt to GDP, at 132%, is already second-highest in the eurozone behind Greece. Poor Italians need more economic growth to generate job opportunities, not public handouts that discourage work. The League’s promise of a pro-growth 15% flat tax is a far better idea, especially in a country where tax avoidance is rife. 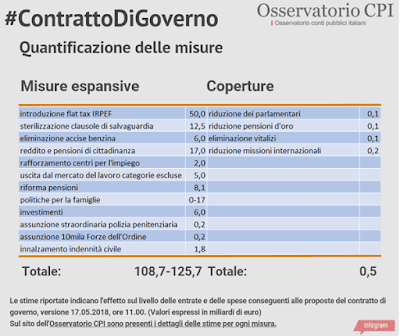 The two parties would also reverse the 2011 Monti government pension reforms, which raised the retirement age and moved Italy toward a contribution-based benefit system. …Recent labor-market reforms may also be on the block." …problematic for the rest of Europe are the two parties’ demand for an exemption from the European Union’s 3% GDP cap on annual budget deficits. …the two parties want the European Central Bank to cancel some €250 billion in Italian debt." Anyone who thought that the Eurozone debt crisis was resolved has not been paying attention to economic and political developments in Italy…the recent Italian parliamentary election…saw a surge in support for populist political parties not known for their commitment to economic orthodoxy or to real economic reform. 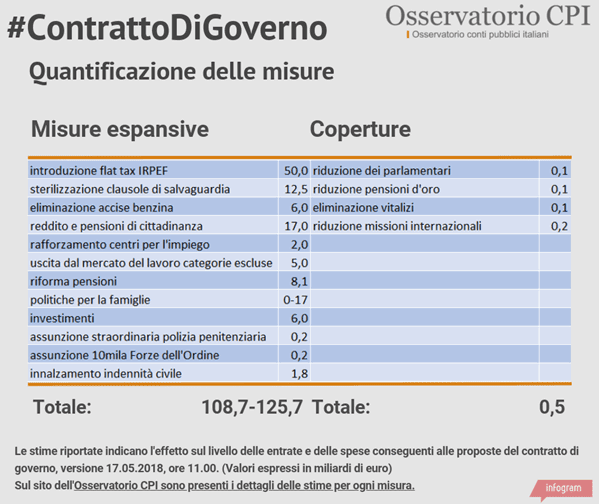 …To say that the Italian economy is in a very poor state would be a gross understatement. Over the past decade, Italy has managed to experience a triple-dip economic recession that has left the level of its economy today 5 percent below its pre-2008 peak. Meanwhile, Italy’s current unemployment level is around double that of its northern neighbors, while its youth unemployment continues to exceed 25 percent. …the country’s public debt to GDP ratio continued to rise to 133 percent, making the country the most indebted country in the Eurozone after Greece. …its banking system remains clogged with non-performing loans that still amount to 15 percent of its balance sheet…"
…having the world’s third-largest government bond market after Japan and the United States, with $2.5 trillion in bonds outstanding, Italy is simply too large a country for even Germany to save. …global policymakers…, it would seem not too early for them to start making contingency plans for a full blown Italian economic crisis." …the Italian economy is far too large an economy to fail if the Euro is to survive in anything like its present form." Daniel J. Mitchell is a Washington-based economist who specializes in fiscal policy, particularly tax reform, international tax competition, and the economic burden of government spending. He also serves on the editorial board of the Cayman Financial Review. This article was originally published on FEE.org. Read the original article. Reprinted from International Liberty.